Albania is normal, the rest of us are crazy. ? The New York Times runs a travel article today touting Albania. I would love to go back. Albania offers cobble-stoned, old seaside towns. -The always wonderful Jane Kramer in the New Yorker. Love that last line. “They can be calmed by beauty.” Who can’t be? I haven’t been to Albania since the paint jobs. But my main memory of the place from the ’90’s when I was there was in downtown Tirana: a decrepit ferris wheel, only about two stories high, operated, more or less, in what was, more or less, a central square, near a market. On a dark evening only about six of the colored lightbulbs worked on this ferris wheel, of the hundreds that had once graced it, perhaps when it turned in Italian cities before being smuggled across the Adriatic. A loudspeaker played some carnival music, cutting in and out, the music sputtering in the night air. No one seemed to mind the music stopping frequently, and then picking up where it had left off. The ferris wheel turned, but slowly. It turned backwards, counter-clockwise, in error. But in one car stood on all fours, a dirty, white, long-haired, crazy, goat. Standing in that ferris wheel cab, the music going on and off, a few colored lights, and one scraggly, very confused goat, slowly turning his head left and right, wondering what’s going on, and going slowly around, backwards – that’s my image of Albania. 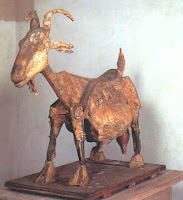 and if Picasso’s goat reminds him of the way Tirana was, before he was Mayor. You are currently browsing the archives for the Albania category.